Jalandhar: Under an initiative taken by LPU and Afghan University Sunshine, Lovely Professional University hosted international cricket series between teams of Afghanistan and LPU. The arrangement was to provide international exposure to both the teams. Afghan Team spent 15 days at LPU for cricket series, and played five One-day and three 20-20 Matches at the University Cricket Ground, following all standards of international matches. Chancellor Mr Ghulam Rasoul Nabizada of Afghan University Sunshine reached LPU Campus as Chief Guest to witness the final match and to encourage the players of both sides. Vice Chancellor (Academics) Mr Zarif Aminyar and Vice Chancellor (Administrative) Mr Shir Mohammad Bayan were accompanying him. During final show match, Afghan team won the toss, elected to bat first and scored 146 runs by losing all wickets in 33.5 over. 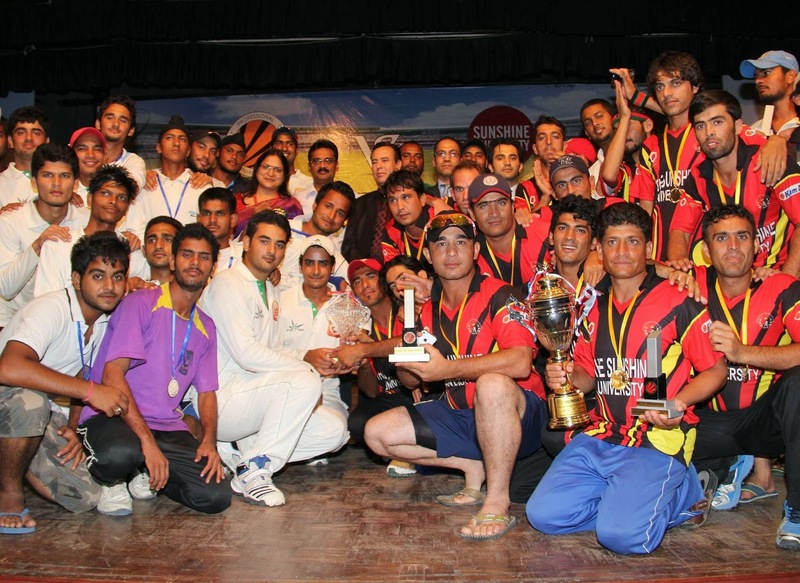 In answer, LPU scored 147 runs for 8 wickets in 34 over, and won the final- show match by 2 wickets. However, series was drawn by 2-2, as one of the matches was abandoned due to rain. No doubt, the Winners-Trophy was to be shared, but the host team surrendered the coveted trophy for the guest Afghan Team. Prior to this, a limited-over trial series of 3 matches of 20 over each, T-20 was also held between two teams. During closing ceremony, the visiting guests awarded winner and runner up teams with relevant trophies. Man of the match was Armaan from Afghanistan who grabbed 6 wickets in the final match. Medals were also provided to the best batsman, best-bowler and other illustrious cricket players of the series. Chancellor Mr Nabizada congratulated the trophy and medal winners and asserted that more such series, tournaments and sports activities will be chalked out. He mentioned: “We want participation of thousands of international students in such endeavours every year to promote & inculcate sports values among students, and pro-sport attitude in global society. Such series further strengthen international understanding and global relations.” Illustrative, well-recognized by Ministry of Education Afghan University Sun Shine is one of the old and renowned private universities of Afghanistan. LPU Chancellor Mr Ashok Mittal and Pro-chancellor Ms Rashmi Mittal also led the visitors on a campus tour. Recognizing the occasion for common interests, an MoU was also signed between Afghan University and LPU for possible academic, cultural, extracurricular activities and personnel exchanges.